DOVER-FOXCROFT — Mainers sure do enjoy apple trees. Whether they are newly planted or as old as the land they are rooted in, they are a treasure to us. The staff at the Piscataquis County Soil and Water Conservation District (PCSWCD) have witnessed this “fruit tree enthusiasm” first hand over the past 3 years, as we have hosted CJ Walke, Orchard Specialist at the Maine Organic Farmers and Gardeners Association, for our Orcharding Series. This year, the PCSWCD is welcoming CJ back for a very interesting and beneficial workshop, Renovating Old Apple Trees. On Saturday, March 3rd, 2018, the PCSWCD will host CJ Walke for this 4th installment in our Orcharding Series. The Renovating Old Apple Trees Workshop will offer participants information on tree nutrient management, disease and pest control, pruning techniques specific to older trees, maintenance timelines and instruction on how participants can successfully bring old apple trees back into production. The information provided during this workshop will be coupled with hands-on demonstrations and opportunities for participants to practice techniques, ask questions specific to their trees and obtain confidence to carry out these techniques at home. CJ Walke has years of experience teaching and mastering organic orcharding practices, and has worked alongside many orcharding experts such as John Bunker of FEDCO Trees and Michael Phillips, author of The Holistic Orchard, among others. CJ has taught orcharding workshops covering topics such as grafting, pruning, pest management, restoring and revitalizing old trees and much more. 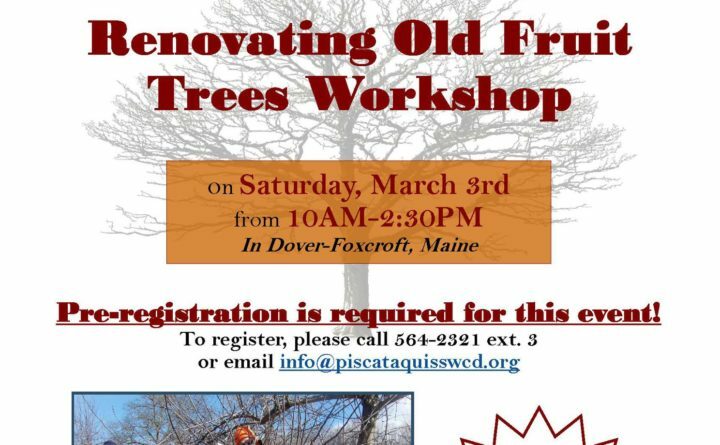 The Renovating Old Apple Trees Workshop will be held in Dover-Foxcroft. Pre-registration is required and space is limited to 30 participants. If you are interested in joining us, we encourage you to register early, as these workshops have always filled to capacity. Workshop participants should plan to bring pruning shears or poles, a bagged lunch and dress for an outdoor event. The PCSWCD will provide hot beverages and snacks upon arrival. For more information and to register, please contact the Piscataquis County Soil and Water Conservation District by calling (207) 564-2321 ext. 3, by emailing us at info@piscataquisswcd.org or by stopping in our office in the USDA Service Center at 42 Engdahl Drive in Dover-Foxcroft, ME. Join us and learn how to bring your old, beautiful fruit trees back into production!